Tundra vegetation is responding rapidly to on-going climate warming. The changes in plant abundance and chemistry might have cascading effects on tundra food webs, but an integrated understanding of how the responses vary between habitats and across environmental gradients is lacking. We assessed responses in plant abundance and plant chemistry to warmer climate, both at species and community levels, in two different habitats. 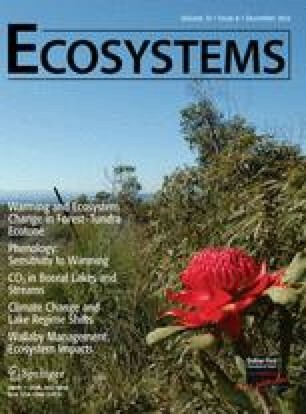 We used a long-term and multisite warming (OTC) experiment in the Scandinavian forest–tundra ecotone to investigate (i) changes in plant community composition and (ii) responses in foliar nitrogen, phosphorus, and carbon-based secondary compound concentrations in two dominant evergreen dwarf-shrubs (Empetrum hermaphroditum and Vaccinium vitis-idaea) and two deciduous shrubs (Vaccinium myrtillus and Betula nana). We found that initial plant community composition, and the functional traits of these plants, will determine the responsiveness of the community composition, and thus community traits, to experimental warming. Although changes in plant chemistry within species were minor, alterations in plant community composition drive changes in community-level nutrient concentrations. In view of projected climate change, our results suggest that plant abundance will increase in the future, but nutrient concentrations in the tundra field layer vegetation will decrease. These effects are large enough to have knock-on consequences for major ecosystem processes like herbivory and nutrient cycling. The reduced food quality could lead to weaker trophic cascades and weaker top down control of plant community biomass and composition in the future. However, the opposite effects in forest indicate that these changes might be obscured by advancing treeline forests. EK analyzed the data and wrote the paper with contributions from all coauthors. EK and OK performed the vegetation analyses. EK and JO planned this study and prepared samples for chemical analyses. RB, AH, HH, UM, SS, PW, and JO designed, established, and maintained the field experiment. The online version of this article (doi: 10.1007/s10021-012-9580-9) contains supplementary material, which is available to authorized users. The authors thank Suvi Katves and Jonas Gustafsson for their invaluable help in the field. “DART”(Dynamics of the Arctic Treeline) project colleagues are acknowledged for establishing and running the experiment. Kongsvoll Biological Station, Abisko Scientific Research Station, and Joatka Fjellstue provided warm accommodations during the field work periods. The work was founded by the European Commission Framework Programme IV grant ENV4-CT97-0586 to DART project, the Swedish Research Council for Environment, Agricultural Science and Spatial Planning to JO and stipends to EK from the Abisko Scientific Station, Norrbotten, Sweden and G & R Björkman.